Rio Grande Mayor, left, and Village Fiscal Officer Jennifer Harrison, right, discuss village matters Tuesday evening during the Rio Grande Council meeting. 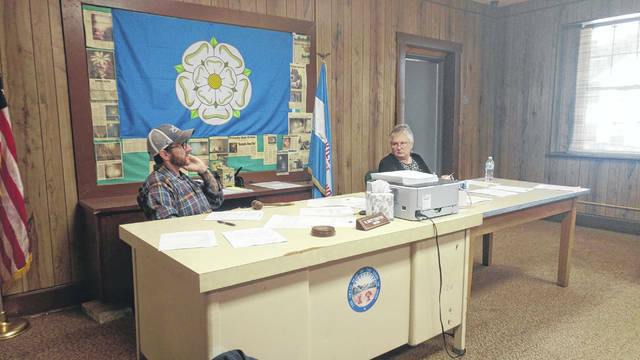 RIO GRANDE — Rio Grande Village Council met for its regular meeting Tuesday evening and discussed its intentions to mail letters to both the Bob Evans Farm and Buckeye Hills Career Center in hopes of persuading them to join village limits. Four council members were present to sign the letters with the other two absent. The letter was also signed by Rio Grande Mayor Matt Easter. The letter asks both entities to consider being annexed into village limits. Both the farm and the career center sit contiguous with village limits and utilize sewer and water utilities through the municipality, the letter says. It claims the entities would benefit from not having to pay outside rates for those utilities and would benefit from local police and fire protection. The letter claims that if the groups needed emergency services, they may potentially have to wait for county services from within Gallia’s 471 square miles. If annexed into the village, they could benefit from response times from both the nearby Rio Grande Fire Department and Rio Grande Police Department within village limits, which are currently 1.37 square miles. The mayor said any previous agreements made between Raccoon Township and the Village of Rio Grande for fire protection are still in effect. Fire protection would not differ due to annexation requests and would remain constant. In January 2016, the letters say that Rio Grande police, while investigating another case, were able to learn of a suspect destroying property at the farm and garner a confession. In Aug. 2015, a report of an active shooter on the campus of the career center was answered by Rio Grande police as the first responding agency on scene. Through the investigation, the report was considered a false alarm. The letters state village officials feel being annexed into the the village would be “a huge asset” to the respective organizations. The last piece of land to be annexed by the village was a plot of land around the size of seven acres just north of U.S. 35 with a few apartments. Previous to that, the village annexed a ResCare facility on Cherry Ridge Road into municipal limits in July 2015. Dean Wright can be reached at 740-446-2342, ext. 2103. Editor’s note, this story has been modified from its Wednesday publishing to reflect a clarifying statement given by Rio Grande Mayor Matt Easter Thursday regarding the annexation request made by the village.